Private and business customers in SE21 area looking for affordable and reliable removal and delivery solutions for their household or business should definitely turn to Man and Van Dulwich – the local relocation and delivery experts. We provide a wide range of versatile and inexpensive services covering everything from small scale removal jobs to comprehensive relocation projects and all in between. The company maintains week round availability on all services, including bank holidays. Business 2 business & business 2 customer deliveries. In addition, we also offer convenient options like professional cleaning (including tenancy), affordable packing and storage solutions, delivery of packing materials (crate hire as well), licensed rubbish removals (domestic & commercial), full property clearances. We are quite confident that ours are the most affordable man and van moving services available in SE21 area right now. We ensure optimal cost efficiency for all customers, regardless of how small or elaborate the project at hand. Being a professional man and van company in Dulwich we have made sure that our removal teams are up to the task. Private and business customers in SE21 area are serviced by diligent, well organised moving teams, made up of qualified drivers and experienced porters who know their work inside out. Expertise of our removal teams spans over all aspects and stages of the service. If needed, our guys can do the packing, securing and inventory of items prior to shifting and removal. All necessary measures are taken to prevent damage or loss of valuables during the service. We operate a fleet of specialised removal vans of the appropriate size and load capacity. Our vans are stocked with all necessary equipment for an efficient and safe removal. Dulwich is a large suburb of south London, divided between the boroughs of Lambeth and Southwark. 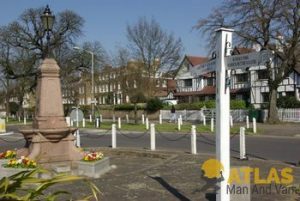 The suburb is actually made up of three parts called East Dulwich, West Dulwich and Dulwich Village – which is the historic centre of the suburb itself and features exceptionally preserved 18th century buildings. Dulwich has a long spanning history and is home to many architectural and historic landmarks. One key place of interest in the area is famous Dulwich Picture Gallery built in 1814.